Read a lot do you? Or fancy yourself being the next Hemingway and have thoroughly memorised a dictionary or two to prove it? Well, you are in luck. If you don’t make it in the literary world, there’s always Crossword Cash. Made by IWG, the game is all about forming words together to make some serious dough. Suitable not only for eggheads and snooty university graduates it’s, in fact, a widely appealing and smooth-playing game for the masses. More, if you are a crossword fanatic the game was expressly made for you and you alone. Come take a look at the kind of cash and fun this game can output. If you are expecting the latest eye-candy you won’t get it. 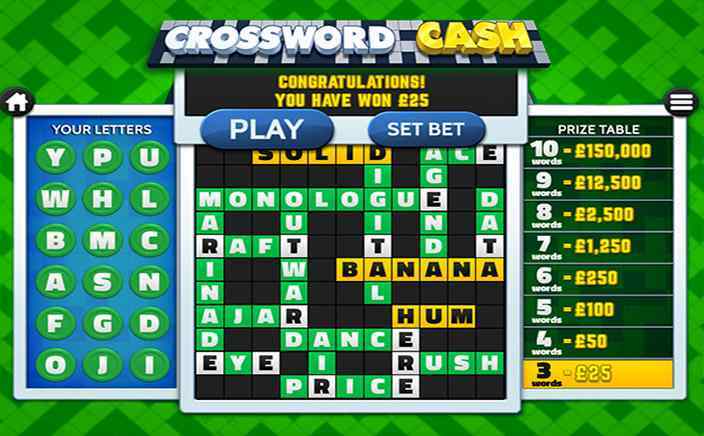 Crossword Cash is largely bare-bones and strictly functional. In the background is a green-coloured crossword design that does well to remind players of just what type of game they are getting involved with. In the foreground are the “+” and “-” signs for adding to or reducing your bets. There’s also a grid of letters on the screen, while the prize table takes up a corner. The prize table as one would expect keeps players informed of what they stand to gain when they complete the indicated number of words. To win, players must match a total of 18 letters in the grid. This will result in their completing certain words and will enable them to win varied prize amounts. 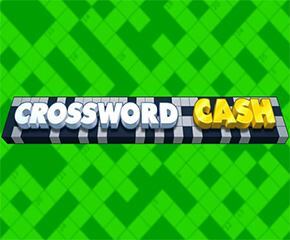 How to Play Crossword Cash? To play, the stake must first be decided. Once this is done and adjusted to your satisfaction the game officially begins. All completed letters will fill their positions on the grid and reveal or suggest others in turn. Each completed words gains you a prize, though winning the total prize is possible only if you finish the game. When gameplay is at an end, players can optionally restart it by once more clicking the “Play” button. Who knew crossword could be so rewarding. There is a higher chance of winning big. The game might be a little basic. But that is totally forgotten the more it is played. All too soon one is addicted! Overall, Crossword Cash offers the opportunity of really exercising the powers of recall, reasoning and logic and having fun while doing so. Overall, this is a game that’s playable by all ages and is totally recommended.